The range of accurate power easurement extends down to a low 100 milliwatts. This kit was conceived to fill a need within the hobby for an inexpensive, highly accurate RF power and VSWR meter for QRP power levels. With it’s large digital display it makes a very useful addition to your shack. printed circuit board construction is used, with solder mask and silk screened component reference designators. All components are through-hole for easy assembly. NO toroids are required, and all controls and jacks are PCB mounted. 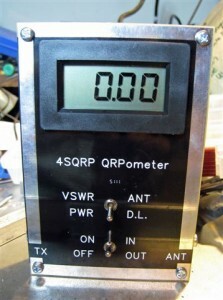 The QRPometer can be constructed by beginners as well as experienced builders. Construction time is approximately 3 hours, depending on experience level. The only equipment required for calibration is a digital voltmeter, and a QRP transmitter..
UPDATE: See comments–first run of these kits sold out within 27 hours! More to come later. This entry was posted in Kits, News and tagged Four State QRP Group, Ham Radio Kits, Kits, OzarkCon, Power Meter, QRP Kits, QRPometer, The QRPometer. Bookmark the permalink. Wow–I just heard that their first run has already sold out. Incredible. and understanding, and thank you for your great support. I love this radio stuff ! Do not use IC sockets on this PCB, the meter display will not fit on top of the chip.